Time to update our exclusive annual analysis of pharmacist salaries. We again rely on the latest Occupational Employment Statistics (OES) data from the Bureau of Labor Statistics (BLS). 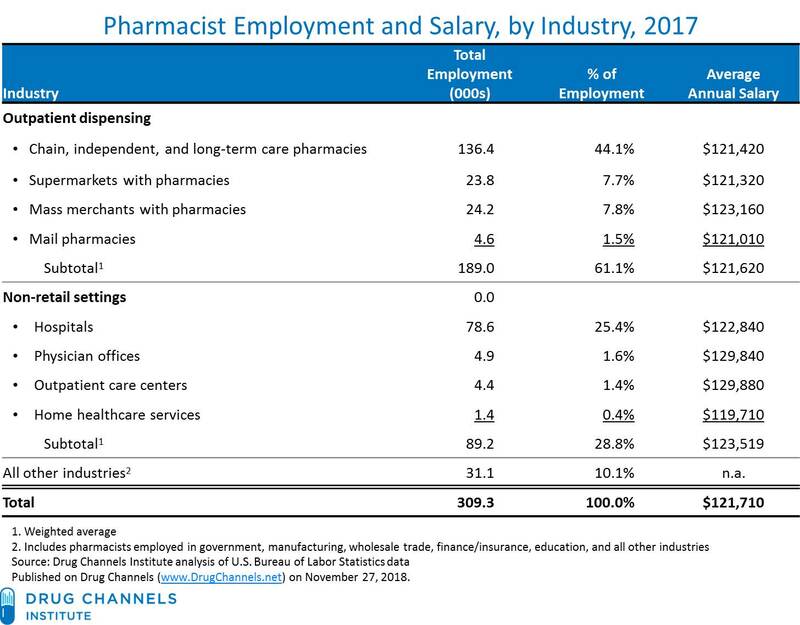 For 2017, the average gross base salary for a pharmacist at a retail, mail, long-term care, and specialty pharmacy reached nearly $122,000—up slightly from the 2016 figure. Meanwhile, the share of pharmacists who work at hospitals reached a new high. Pharmacists who work at hospitals also had higher salaries and greater salary increases than those of pharmacists in outpatient dispensing formats. Some people have predicted doom and gloom for pharmacists. These latest data show otherwise, though the ongoing shift to specialty drugs is altering long-standing employment patterns. Below, I profile pharmacist employment and salaries. I also offer a few controversial thoughts on U.S. healthcare spending and the industry’s salaries. BLS and the State Workforce Agencies (SWAs) collaborate on the OES survey. BLS funds the survey and dictates its structure, while the SWAs collect most of the data. The OES survey categorizes workers by detailed occupations based upon the Standard Occupational Classification (SOC) system. For more on these data, see the OES FAQ page. The Pharmacist occupation code is 29-1051. Using these data, we identified pharmacists working in various retail and non-retail settings based on the NAICS (North American Industry Classification System). Note that BLS computes the annual wage data by multiplying an hourly mean wage by a "year-round, full-time" figure of 2,080 hours. The data below show full-time, gross salaries. The figures exclude bonuses and employer costs of nonwage benefits, such as health insurance and contributions to retirement plans. The data also exclude business owners and partners in unincorporated firms. Independent pharmacy owners are therefore not included in these figures. Pharmacist employment continues to expand. Total U.S. pharmacist employment comprised about 309,000 people in 2017, up by 1.2% compared with the 2016 OES figure. Since 2013, employment has grown by almost 22,000 people (+7.6%). The location of pharmacist employment continues to shift. The share of employment at retail, mail, long-term care, and specialty pharmacies has declined, from 65.2% of pharmacist employment in 2010 to 61.1% in 2017. Meanwhile, hospitals’ share of pharmacist employment has grown, from 23.2% in 2010 to 25.4% in 2017. The remaining pharmacists worked at manufacturers, wholesalers, government agencies, non-hospital healthcare providers, and other organizations. 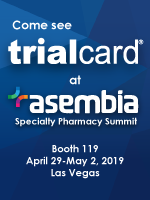 This shift is occurring as hospitals and health systems actively pursue specialty pharmacy dispensing revenues. 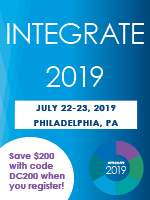 For example, pharmacy locations owned by healthcare providers—such as hospitals, health systems, physician practices, and providers’ group purchasing organizations—have been the fastest-growing category of accredited specialty pharmacies. See The State of Specialty Pharmacy Accreditation in 2017. Among outpatient dispensing formats, pharmacists at mass merchants had the highest average salaries. Pharmacists at mass merchants earned a full-time average salary of more than $123,000. However, pharmacists working in these stores registered the smallest increase in average salary for 2017. Annual salaries at supermarkets and mail pharmacies were comparable to chain, independent, and long-term care formats. Pharmacist salaries at non-retail settings were higher and grew more quickly than those at outpatient pharmacies. Pharmacists working in physician offices and outpatient care facilities received the highest average salaries. These two settings, however, account for a small share of total employment. Pharmacist salaries exceeded those of other healthcare workers, but salary growth lagged again in 2017. Salaries for all healthcare employees averaged $80,760. Thus, average pharmacist salaries were about $41,000 (+51%) higher than average healthcare salaries. The average pharmacist salary grew much more slowly in 2017 than did the average salary for all healthcare workers—whose salaries grew by 2.0% last year. (See chart below.) Average pharmacist salaries at hospitals for 2017 grew by 1.5%, to almost $123,000. 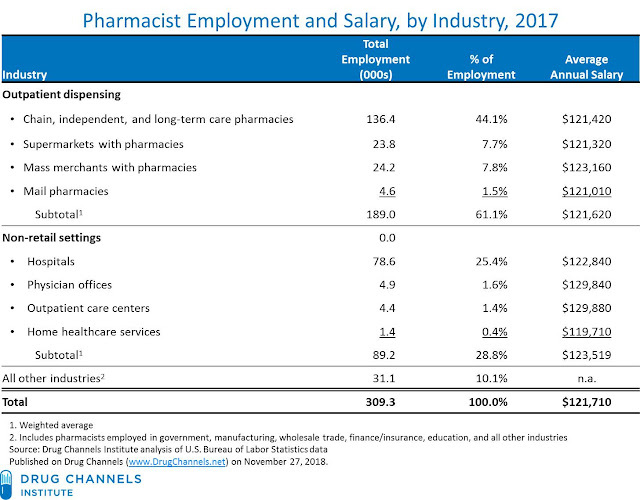 Total pharmacist employment is projected to grow in coming years. 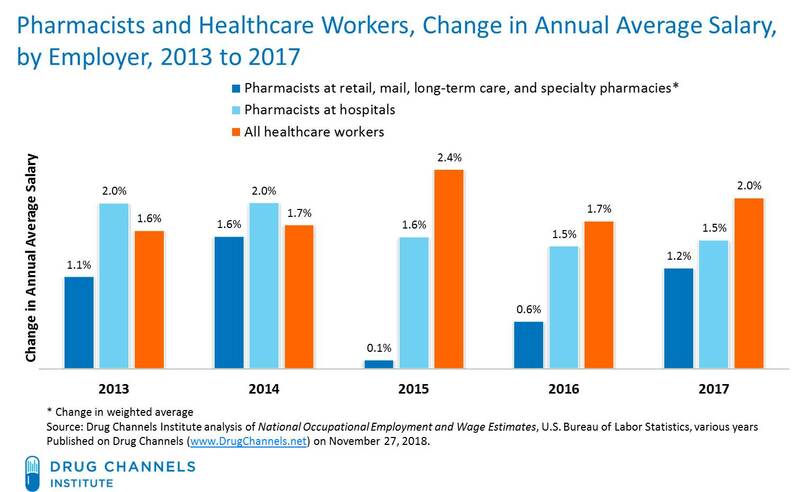 What’s more, growth in pharmacist jobs at hospitals, physician offices, and other non-retail settings is expected to outpace growth at conventional retail and mail outpatient pharmacies. See 2026 Pharmacist Job Outlook Looks Good, Especially for Hospital Pharmacists. Salaries are a key reason U.S. healthcare is so much more expensive than that of other countries. Despite what you might read or believe, drug prices are not the primary cause of our country’s higher spending. For 2017, 14 of the top 15 highest paid U.S. occupations were in healthcare. 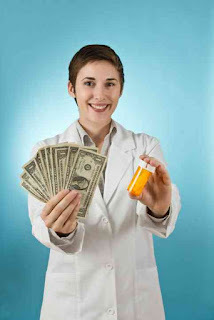 Pharmacists were the 45th most highly paid occupation, edging out Astronomers and Physicists. (Visit https://www.bls.gov/oes/current/oes_nat.htm and sort by the Annual Mean Wage column.) Total base compensation for U.S. pharmacists was $37.7 billion in 2017—an increase of almost $1 billion since 2016. Remember these facts whenever you hear calls to “reduce healthcare spending.” Whether you realize it or not, this requires cutting healthcare salaries. It’s so much easier for politicians to rail against the pharmaceutical industry than confront the real challenge of cutting wages for so many voters.